A decade ago, I spent two summers as a camp counsellor. I took groups of teenage girls on four-day camping and hiking trips. Please … no more coolers. And leading trips! I also got pretty good a leading trips. Because it is not kosher to put photos of kids on the internet without permission, here is a photo of me on the tallest mountain in Maine. Since getting involved with the Alpine Club last, I wanted to get back into leading trips. But felt a bit intimidated by how much more experienced everyone else seemed to be. On my last ACC trip on 5040, I was encouraged by our trip leader, Colin, to just give it a go. He explained to me the logistics of how it worked. It seemed pretty easy, so I put a trip to Empress Mt. in the Sooke Hills on the calendar. We had a full trip — 11 people and 2 dogs. I asked my friend Dave to co-lead with me, as I knew it would be hard to keep a group that big together. Dave stayed at the front and I stayed at the back to make sure we didn’t lose anyone. 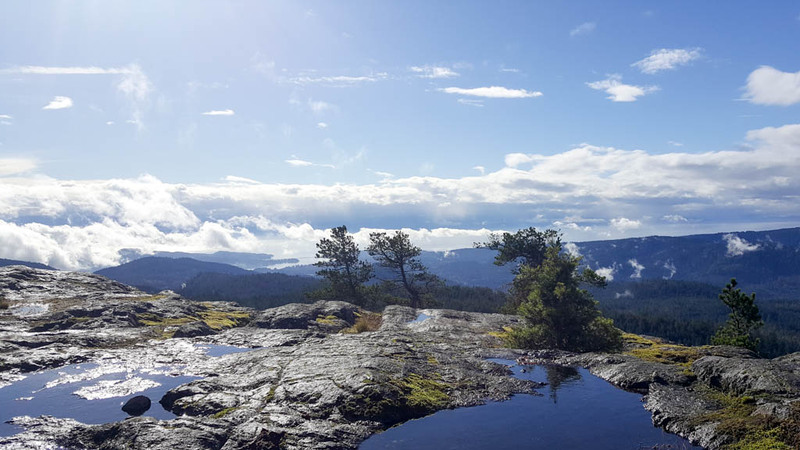 Empress is the tallest mountain in the Sooke Hills. It’s not a particularly nice hike, as it’s a long slog up rocky trails and through creeks. So it was great to be rewarded with a nice view! The experience of leading a trip is different from just going for a hike. Some of the benefits of hiking for me are getting a chance to think deeply about something or stop thinking at all. This was not the case at all on this particular hike, though I don’t mind at all. It’s nice to take people out to places I love.